This week I've continued cycling to work even though there's been snow every day. I've been using my mountain bike (with semi-slick tyres) and every day I get comments from people telling me how brave/mad/stupid I am. Today was the worst the snow has been and I struggled a bit. There was up to a foot of snow and because not many cars had gone out there wasn't a very good clearing on the road. Where there was, it was generally on the other side of the road, as most cars go in the opposite direction to me. When I could safely do so, I rode on the opposite side of the road. I haven't yet fallen off the bike but I've had a few slippery moments. My balance is quite good on the bike. I'd suggest those that don't have great balance, patience or ability should leave their bikes at home. Everyone else should get on their bikes. When it's as snowy as it was this morning it's so nice to be out there almost alone. Worst case is, you fall off into the thick soft snow. I get the "you're mad", "you're harder than me" comments, but in reality it makes sense to cycle to work in these conditions. You're never going to get stranded, if you have the right kit you ain't cold or wet and let's not forget the usual commuting benefits. Cheaper, healthier, gives you a morale lift and it's green. Although in all fairness I don't give the last one too much thought! The challenge we faced last winter came after the roads were plowed clear. We had nearly 4 ft of snow over a two week period! That left huge piles of plowed snow everywhere. Every day some would melt and trickle back in to the roads, then re-freeze at night. Leaving bits of "black ice" everywhere. Hard to see except in a little shine from your head light. If you coast over it in a straight line, no problem. Try to brake, steer or accelerate and you find your self with the wheels up and the rider down in a blink. After a few of my fellow club riders took nasty spills, and one for me too, I acquired a pair of studded tires from Schwalbe. They have little steel studs embedded in the treads. Heavy, loud, and they slow you down on clear pavement. But I never fell on ice while riding them. All of that is to say... enjoy the winter riding, it really is beautiful, but do be careful. Did I mention how much I love your photo? I don't think I did. As you have braved it in the snow I shall do the same... but I shall just have a nice cuppa tea first. Love the photo. Especially the jacket. Cheers for your comments guys. I often push myself to cycle in these conditions as if I don't I won't know if it can be done or not. Mike - If it's too icy I may just not cycle on those days but we don't often have problems with ice. Emma - Can't remember where I got that jacket ;-) It's been a lifesaver since it started getting cold. Well done for getting on with it during the snow, top stuff! yes - I love the piccie too! We have had very little snow (here in Chester)meaning more ice on the thin layers in the lanes. I had to pop out last Sunday, and even though I waited till 2pm, it was still -6, so anything other than main routes, especially bits that didn't see the sun, were sheet ice. 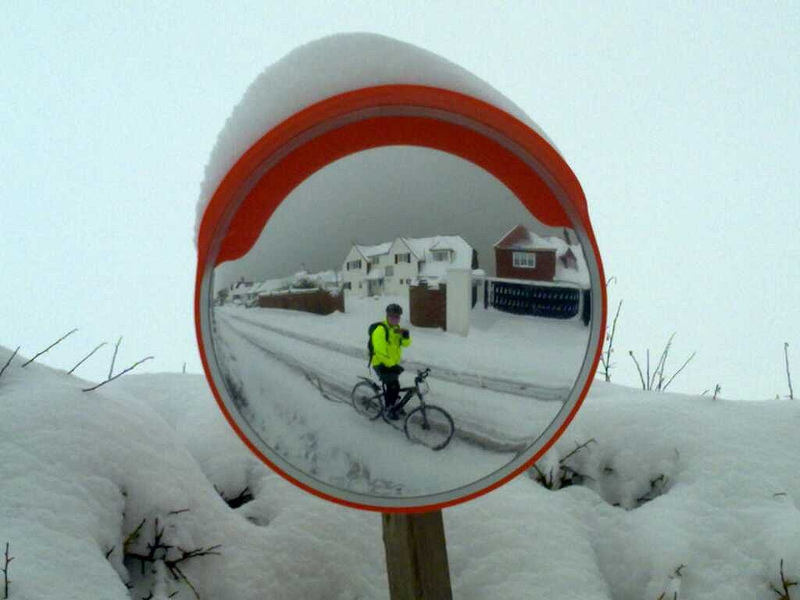 I don't commute in the winter, more to do with darkness of lanes and type of driver we have between my work and my home - but we are due to have our Cycling Club lunch on Sunday! I do love the snow - but don't your feet get cold as your tyres spray snow up your shins??!! Simon - The ride home was easy by comparison. Sue - my feet get freezing but not due to the snow.